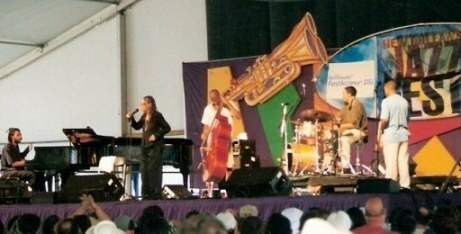 If you think New Orleans performers are restricted to jazz muisicians - well you haven't been there yet! 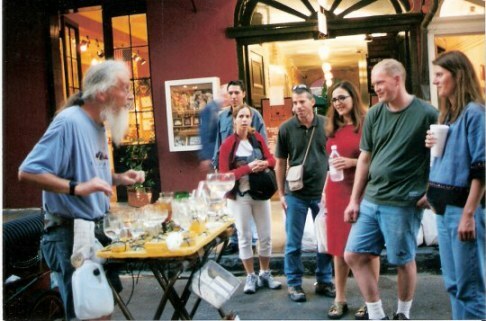 Apart from the performers in bars – there is often some sort of magic happening on the streets of New Orleans as well. There are always festivals and parades of some sort happening. When I first went there I used to think the police sirens were indicating something of a dangerous nature – but then I realized that they were indicating something of a festive nature instead. 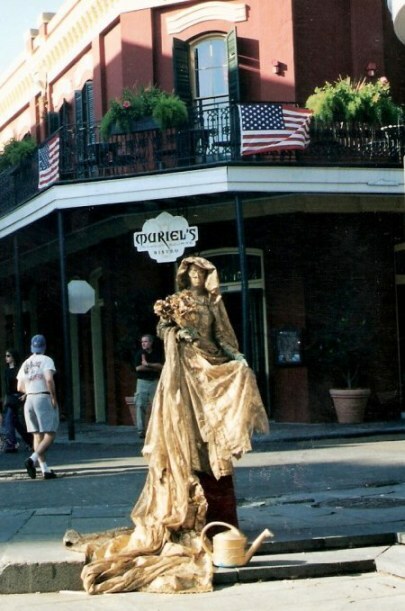 It might be that you are sipping a drink in the French Quarter and a spontaneous parade passes by, like this one celebrating something, that appeared - and disappeared almost as quickly! Celebration seems to be everywhere in New Orleans – and hearty celebrators are the Irish and Italians, whose previously separate parades are now one . March 17th is St. Patrick’s day – and also the Italian National Day – resulting an a sort of excess of charm. Given the two nationalities, a girl is bound to be kissed! 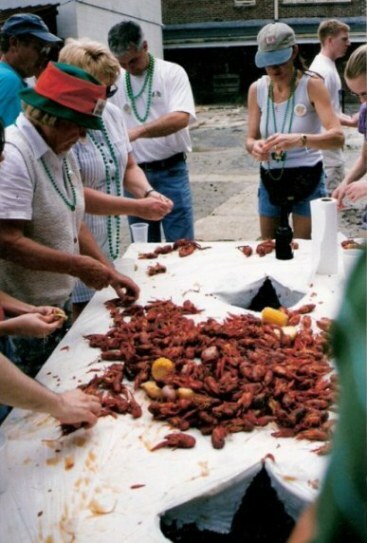 In former years, I met with friends for a Crawfish Boil between the two parades. Of course this is eaten in the open air at tables with plenty of paper towel. Nicely cajun spiced crawfish and cold beer on a hot day with friends and then more parade to enjoy afterwards. A typical way to enjoy living in this amazing city. 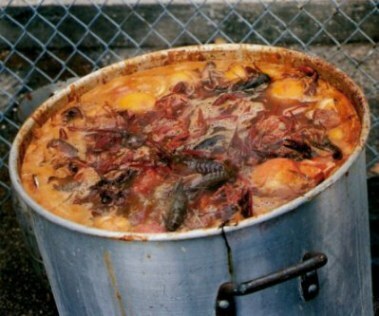 Crawfish boils are something of an institution in New Orleans, being held by all sorts of groups all through the summer. Both Tulane University and The University of New Orleans hold Crawfests for students – Tulane in April and UNO at the end of Spring Semester. Say it out loud - and that is basically how you eat the crawfish. 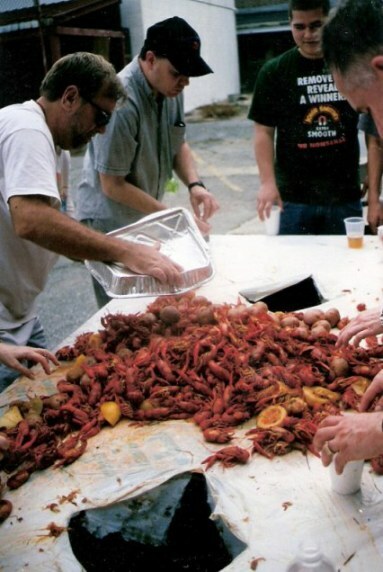 At a Crawfish Boil you just keep eating until you literally cannot face another crustacean. As you can see, we are festooned only by green beads thrown by the Irish in the morning parade and not red hearts stuck on you by the Italians. 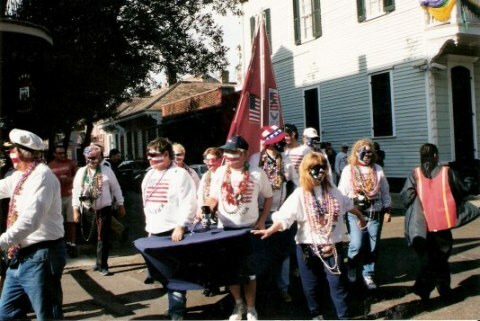 To the amusement of all standing by, later that afternoon as I watched the Italian parade, and amidst a wave of laughter one such heart was strategically placed with infinite charm and ceremony on my left breast by a dark-eyed Italian Krewe member…but how could one complain? There are other types of performances to capture your imagination. From time to time the streets are closed off to traffic for street performers. These vary in their levels of creativity – here with marvelous harmonics from rubbing the rims of different shaped glasses to perform tunes familiar – and original. 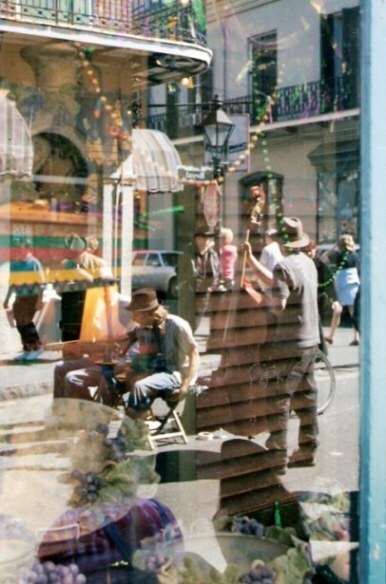 You can be browsing in an antique shop and looking out of the window, see a band. You can be enticed to step outside and form part of the street audience, but somehow the view from inside creates a kaleidoscope of imagery overlapped by sound that seems typically evocative of this city of creativity. 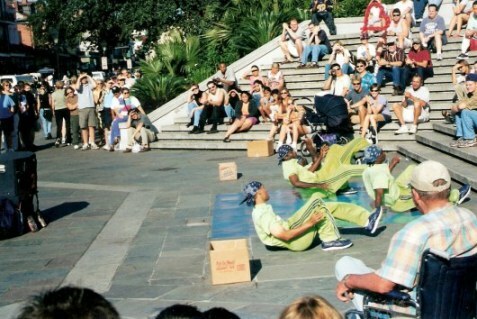 Further up on Jackson Square, where for more than 50 years artists have shown their work, there is usually some sort of performance going on – along with the Jackson Square All Stars. Maybe there will be small cameos like this to capture for your suitcase of memories. Here, immobilised in the humid heat, a human statue earns every penny thrown into the hat. 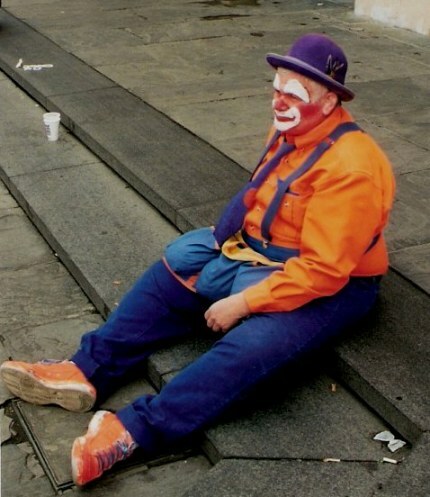 Sometimes even Voodoo can leave you exhausted from its blessings. 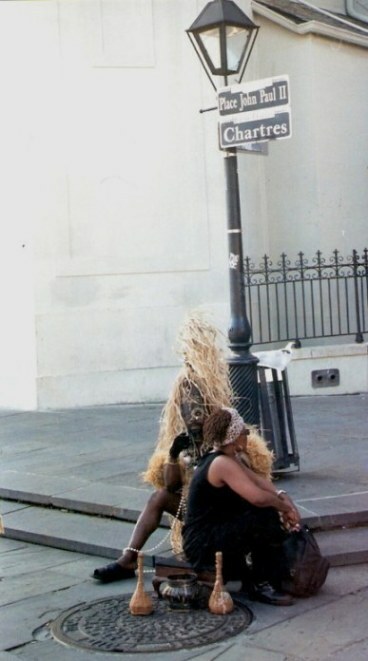 These two are resting at a corner of St. Louis Cathedral. It was this same corner that I was approaching on my homeward walk in the early hours of the morning when I heard the racing hoof beats of a galloping horse. It was coming in my direction so I flattened against the cathedral walls. Around the corner came a sprinting man and seconds later, the mounted policeman at full gallop. Just another event in an eventful city. 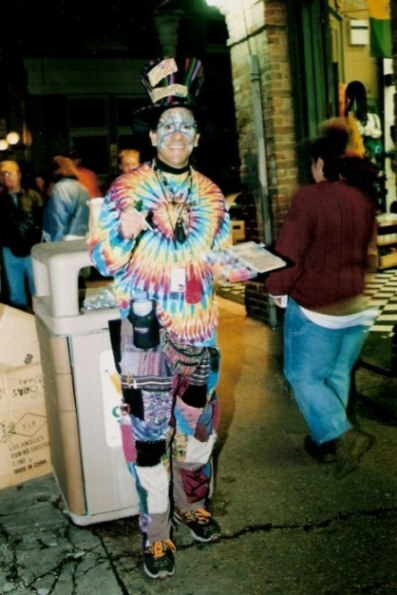 This spontaneous face-painter was a master craftsman and hard to resist as I was scurrying along one evening to meet friends. 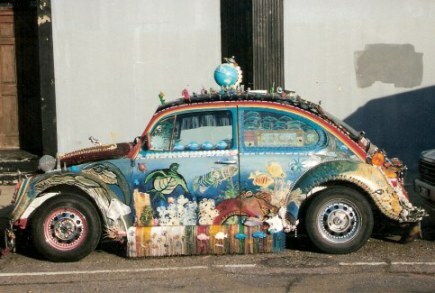 When we talk about performers, we don’t often think of a VW Beatle – unless it is Herbie, immortalized in the Disney films of the same name. 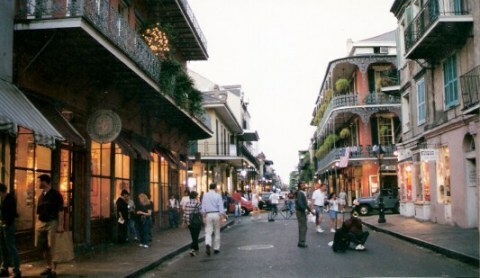 However, in the French Quarter you may still be lucky enough to spot this beauty. I don't know if it made it safely away from Hurricane Katrina. 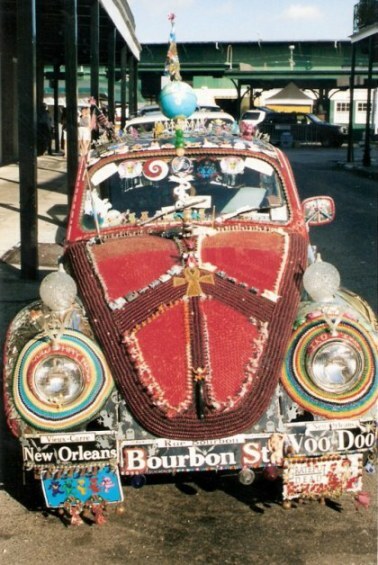 Created by Kelly Israel, this classic used often to be seen on the streets of the French Quarter. The designs combine slogans, beads and bits of this and that. The decorations were modified from time to time. 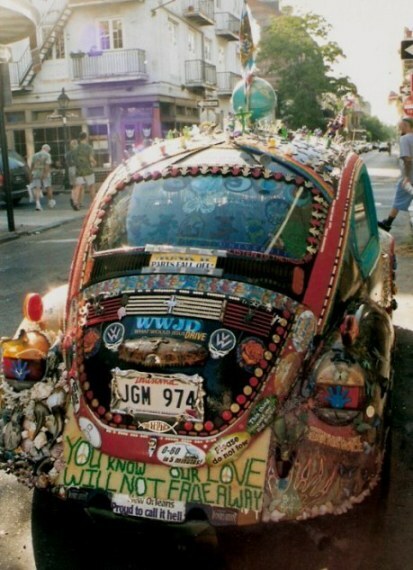 This is my every-day car and any help you can give to keep this masterpiece on the road is gratefully appreciated. Please slip donations through side window. The little triangular wind window is left ajar so you could “post” your donation – and who wouldn’t? 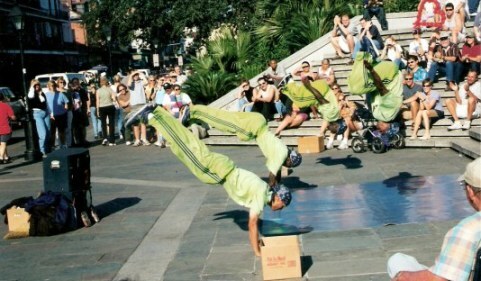 There are other types of street performers always appearing – and this troop were brilliantly agile. Their performance had split second timing that must have taken hours and hours of practice to get to what seemed like perfection. No matter what sort of performance you are looking for, whether it’s JazzFest...or whether you are just looking for what’s on tonight - check out the OFFBEAT Magazine to see what’s on. Started by Jan Ramsay, one of the many high perfomers and icons of an icon-filled city, it is the bible of what’s happening in New Orleans. Some performers make their own special music - that of a child's laughter is one...or the smile of a child suffering cancer on receipt of an unexpected treasure. New Orleans icon and generally lovely person, Dr. Stephen Heinrich started a unuiquely New Orleans 'helping others help those in need' project. As a paediatric orthopaedic surgeon at the New Orleans Children’s hospital, he saw what a difference a cap signed by a sporting celerity made to a scared child who lost his hair as a result of chemotherapy treatment. The subsequent charitable foundation he began, 'Caps for Kids', has now reached over 100 US hospitals. If you know a sports celebrity who would donate a cap, please direct them to their site. Perhaps you may donate yourself. We appreciate the music – but the reality is that for many New Orleans musicians, even those who are well known globally, life is a constant financial struggle. Given the cost of private health care in the USA, many performers find themselves in a difficult position when they fall ill. The Musicians Clinic is a project initiated by the profoundly humane medical doctor and highly accredited researcher Dr. Jack McConnel, who brought us Tylenol and was a pioneer of Magnetic Resonance Imaging, more commonly known as the MRI scan. The Musicians Clinic was developed in conjunction with Johann and Bethany Bultman (two more New Orleans treasures) - and has been a significant benefit to the musicians and artists of New Orleans. This is an NBC news report about the Musicians Clinic. Since 1998 the Musicians Clinic has been caring for the health needs of musicians who could not otherwise afford it. 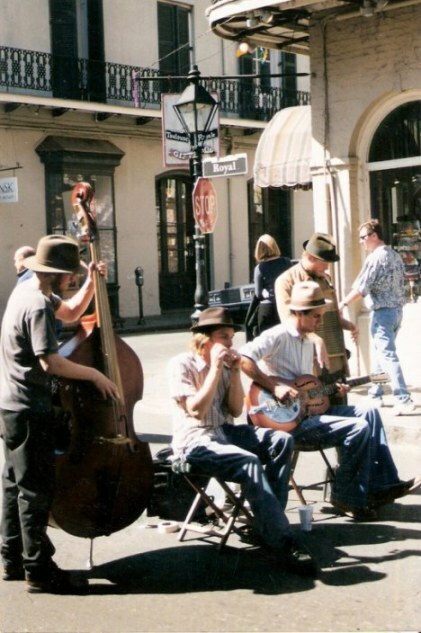 This heightened with Hurricane Katrina, when so many lost their instruments, equipment, collections – and with visitor numbers falling off and a diminishing number of musicians returning to the city following the devastation – limited their working opportunities. The Musicians Clinic was founded as a charitable foundation (enabling tax deductions for US taxpayers for their supporting donations) and it is now faces threats of closure. It needs our help. Please donate – even just a few dollars will make a difference. 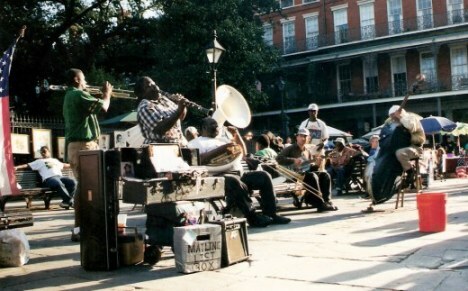 It would be wonderful if each of us gave a dollar/pound/euro or other currency denomination equivalent amounting to just the same period of time that our soul was touched by New Orleans music.